Do not curse at, disobey, disrespect, aggravate, back talk, slap box with, or shadow box with the trainer. Do not leave wraps, gloves, shoes, mouthpiece, cups, headgear, or anything else on the floor for someone else to pick up – do it yourself. Nobody cares how you feel. Keep it to yourself. 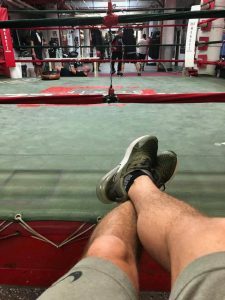 No lying on the floor, hugging the heavy bags, running around the gym, or pursuing any other end which does not constitute the means of becoming a champion. Order Ricky Ray Taylor’s Book Punches & Prayers: A Fighter’s Journey from the Gulf Coast to the Big Apple on Barnes and Noble Today.